Advocacy and corporate accountability campaigns are some of the longest and toughest fights for nonprofits to win. But these campaigns can also be the most exciting to work on for nonprofit staff, especially if your organization has the creative freedom to launch aggressive and targeted campaigns. But the excitement around advocacy and corporate accountably campaigns can quickly loose steam if your organization falls into the trap of developing strategies and tactics that focus on persuading key decision makers rather then building power and pressuring them. Why? Because the truth is policy makers and corporate targets don’t respond to persuasive arguments often, they respond to public pressure from their constituents or customers. Persuasion tactics like highlighting the root of the problem, compiling research and releasing reports has its time and place in campaigns, especially when you are mobilizing your base, so don’t completely abandon them. Just make sure that your persuasion tactics are not dominating your campaign. 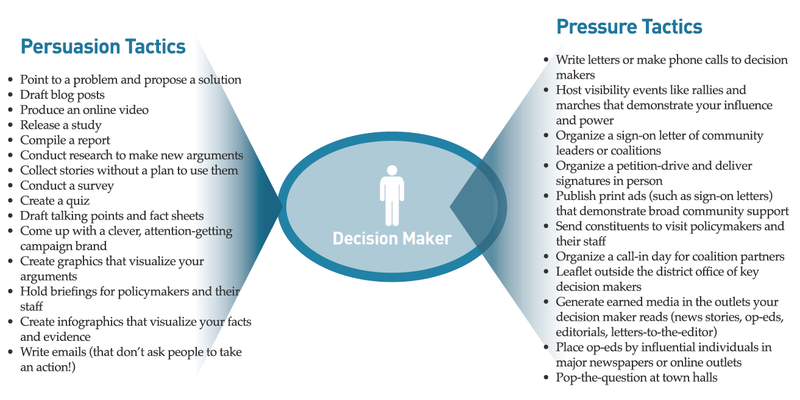 Check out this terrific chart below by M+R Strategic Services that outlines how you can be turning some of your standard persuasion tactics into effective, tactical ones that pressure decision makers, and that will ultimately help you win the campaign. If you are in the process of planning a campaign, consider these questions posed by M+R. 1. Which priority decision maker(s) has the ability to say yes to what we want and whose support will help us win the campaign? Be selective! settle for trying to persuade them. 4. Which pressure tactics fit our strengths as an organization? Design your plan around your assets. 5. Which tactics and strategies will have the best “bang for our buck”? Prioritize! 6. How do we sequence these tactics to build power and put it to use? Timing is everything – have a plan. 7. How do we make sure we have room to add additional tactics if we are not successful with the first round, or the second, or the third? Think about building and deploying power over the long-term. What are some of your favorite tactics to pressure decision makers during advocacy or corporate accountability campaigns?